Len Dykhuizen (left) and Ernie Whitehead are seen in these undated RCMP handout images. Back in 1987, two men from B.C. 's Shuswap region loaded into a two-seat plane and took off on a fishing trip, never to be seen again. Now, more than 30 years later, the mystery of their disappearance may finally be solved. Wreckage that authorities believe to be the Piper Super Cub aircraft that vanished with Ernie G. Whitehead and Len Dykhuizen on board decades ago was located in Wells Gray Provincial Park last month. The long-awaited discovery came as crews were searching for another missing plane, which sadly remains unaccounted for. The crash site is remote, with no nearby roads or trails, but RCMP Cpl. Dan Moskaluk said a member of the Joint Rescue Coordination Centre was able to rappel down from a helicopter to photograph the plane’s identifying markings. 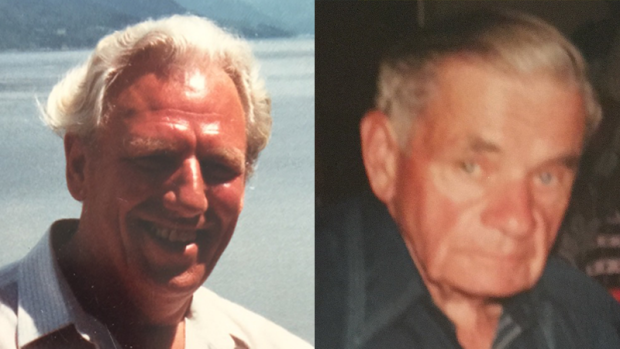 The families of Whitehead and Dykhuizen, who were 78 and 55 at the time of their disappearance, have been notified of the development. "We would hope that would offer them a degree of solace, that we've located the plane now that's been missing for these many decades," Moskaluk said. Authorities have not seen any sign of the two Eagle Bay residents' remains, and weather conditions have made it challenging to view the wreckage from the air, but Moskaluk said a full search will be launched next year. "Efforts will continue in the spring to locate and hopefully recover the remains," he told CTV News. Whitehead was piloting the private plane and Dykhuizen was his passenger when they headed out on the fateful trip on June 20, 1987. Extensive searches were conducted at the time, but turned up no sign of the plane or its occupants. The men's families have asked for privacy in light of the discovery.